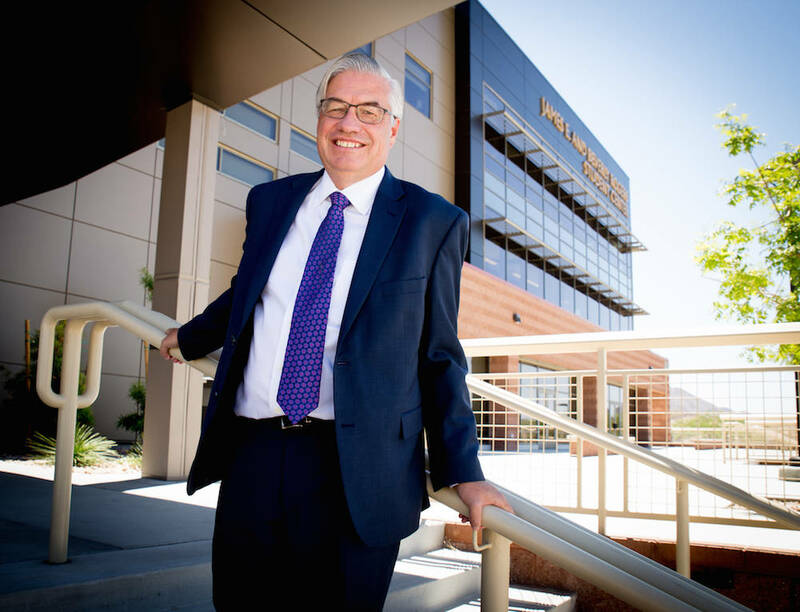 The longest-serving president in Nevada State College’s history, Bart Patterson, said he never dreamed of working in education. Earning a juris doctor from Duke University School of Law in 1987, Patterson worked more than 13 years as an attorney before entering the world of academia. Patterson was appointed president of NSC in 2012 after serving as interim president for six months. Now, having served over five years as president at the rapidly growing NSC campus, he can’t imagine doing anything else. Having served as the Nevada System of Higher Education’s chief counsel since 2006, Patterson went on to be the vice chancellor of administrative and legal affairs for the organization in 2009. He also served as deputy general counsel, assistant general counsel and as general counsel for the Community College of Southern Nevada and NSC. Prior to joining the Nevada System of Higher Education in 2001, Patterson was an attorney in private practice. Q: What are your goals as Nevada State College president? A: My top goal is to improve the students’ success rate so more students graduate and are successful in the work force. Over the next five years, building out an education program is my top academic objective. I have a lot of objectives around building a better student experience and making this a top place to work for our faculty and staff. Beyond that we’re in that stage where anything is possible. We are a young college and there are a number of things we have the opportunity to build. Q: How are you going to accomplish your academic objective? A: We first have to expand the pipeline of teachers and that involves getting more students in K-12 system to select teaching as a profession. Nationwide, the number of students choosing education degrees has dropped significantly. Clark County School District in particular suffers from a lack of qualified applicants. There are not enough graduates coming out of our education programs to fill the need. One of the things we are looking at doing is building what we call Teacher Academies. This is to early identify students in the K-12 system, particularly in their junior and senior years of high school, who want to go into teaching. Once identified, we will provide them with dual-credit opportunities so they start to gain college credits in education and general studies. The dual-credit program is going on now. We started the first two pilots with Mojave High School and Southeast Career Tech Academy. We have 14 students at Mojave and 22 at SECTA. Also, we are looking at how we can provide scholarship funding to help incentivize choosing education as a career. We just are starting within the next year our first masters in speech pathology, which is an important master degree for the state. Most states require a masters degree in order to practice. We’re one of the few states where the school district allows students with a bachelor’s degree to practice in the field. We stared a program in deaf studies that will start this fall to help address needs primarily in the school district. Within the next two years we believe we’ll start an early childhood education program that will be a new major for us. Q: What have you accomplished during your term as president? A: We were the first institution in the state to build two academic buildings (nursing, science and education building and the Roger’s Student Center) largely through student tuition revenues. The state did not have capitol money to put into these projects and we desperately needed the buildings. The buildings are on 30-year terms like a house mortgage. We are looking at building residential facilities for the first time in college history. I think that will happen within two years. We are developing an international student program, day care and building a new academic program. Q: NSC is celebrating 15 years this year. Are you planning anything special for the anniversary? A: We are going to do something special but it will be later in the year. The specific plans are still being determined. What I expect it will be is an open house atmosphere and inviting local performing artists to be part of it. We want to create a fun atmosphere where you can come enjoy music, food and celebrate the college. I can assure you it will not be a formal stiff sit down dinner. That would not be us. Q: How have you seen the college grow over the last five years? A: The most remarkable growth happened as a result of building the two new buildings. We’ve quadrupled the size of the campus with the addition of the nursing, science and education building and the Roger’s Student center approximately two years ago. We have experienced some pretty remarkable growth over the last five years. Enrollment is up about 25 percent and it’s just going to get bigger. Last year, our first-time freshman population went up 20 percent so that shows the kind of potential growth that could occur here. There’s also a transformation going on in the type of students coming to Nevada State College. We’ve become more diverse and have had an increasing standard of student coming into the college. We’re becoming a first choice for a diverse student population and we’re very excited about the demographic change that is occurring. Our entering high school GPA has climbed every year and is now at 3.02. We have more students that come to us above a 3.5 than below 2.5. Q: How would you like to see it grow. What would you like it to ultimately become? A: We are master planned for a 25,000 student campus with 509 acres of ground. We are intended to be a very significant driver of professional four-year degrees that will meet critical needs of the valley. I want us to continue to grow in those fields; business and education, sciences, nursing and health care fields. Those are going to be the really important drivers for our economy going forward and we need to fill that need as a state college. My preference is that we have steady significant growth. That way we can continue to focus on the quality of student experience and the quality of students that graduate. Those are important in building a reputation of a college. Q: How does the college contribute to the local economy? A: At this point we are not recruiting a national or international student population. About 95 percent of the students who come here are from here. These students are choosing degrees and are planning on staying in the valley. We’ll be increasingly an important factor in the health care sector. We’ve graduated more than 1,000 nurses and that number is going to continue to grow since we tripled the sized of the program in the last two years. We should have the largest education program in the state. We’re planning on increasing the size of it over the next few years and that will be very important. We also like to be innovative. We’re looking in the areas of technology and science where we think we can make the mark in providing a work force that can meet the new society that is focused on automation and technology.